"Derby College was invaluable, and I wouldn’t be where I am now without it." Former mature horticulture student Stuart Thom has reinvented his entire career through hard work and the support of Derby College. Just over ten years ago, Stuart was unhappy in his work at bookshops in Ashbourne and Derby. He decided he needed a change – to find a career where he could see the seasons change and work outside. Stuart attended an open evening at Broomfield Hall, where tutors pointed him towards Level 2 National Certificate in Horticulture. He liked the course and enrolled. Nervous about “going back to school”, Stuart said the environment was welcoming and encouraging. The course provided “tasters” of the sector and helped him decide which areas he wanted to pursue. At an early stage he found the “plant side” of horticulture really appealed, as opposed to other areas such as hard landscaping. His tutors encouraged him to go on to take the two year Level 3 Diploma. And seeing his potential, they supported his application to study for the Royal Horticultural Society’s prestigious Wisley Diploma in Practical Horticulture at RHS Garden Wisley in Surrey. He was one of just ten people accepted on the course in his year. 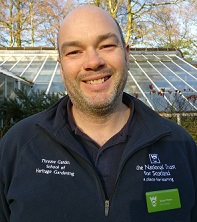 Now aged 41, Stuart has worked for the Crown Estate as a fulltime gardener at the Savill (correct) Garden in Windsor Great Park. He and his gardener wife Nadine are now working in Scotland, where Stuart is RHS co-ordinator at the National Trust for Scotland-runThreave (correct) Garden in Dumfries and Galloway.